DID YOU KNOW THAT SINCE 1998 THE US GOVERNMENT SPENT $21 TRILLION IT CAN’T ACCOUNT FOR? Or that Internet co-ops are mobilizing poor communities to resist net neutrality rollbacks? How about the health risks of wireless tech that cell phone companies have covered up, or the opiate crisis that Big Pharma knowingly unleashed? Haven’t heard the news? Neither did the rest of the world. That’s because these and countless other news items are suppressed or ignored by our nation’s “free press” every day. 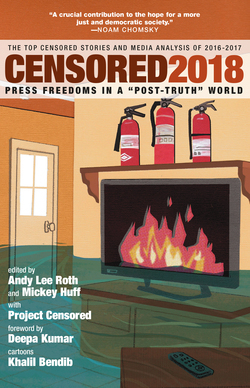 For the past forty-three years, Project Censored has been unearthing the buried stories that corporate media deem unfit to print—and debunking the “fake news” governments and corporations use to consolidate their power—to promote well-informed citizen action and critical media literacy. Plus Junk Food News, News Abuse, and Media Democracy in Action. In a time of decline in the rule of law and democratic safeguards, Project Censored offers a constructive alternative to the “fake news” blues, holding the corporate media to account for its negative bias, propaganda for wealth and power, and outright censorship. 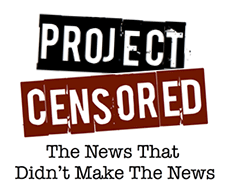 PROJECT CENSORED, founded in 1976 by Carl Jensen at Sonoma State University, has as its principal objective the advocacy for and protection of First Amendment rights, including freedom of information. In 2008, Project Censored received the PEN/Oakland Literary Censorship Award. Most recently, Project Censored received the 2014 Pillar Award in Journalism and New Media, given annually to persons of conscience, conviction, and achievement who stand up for what’s right and what’s true in the face of corporate and political intimidation. For more information, visit www.projectcensored.org. by Project Censored, Peter Phillips, et al. by Project Censored, Dennis Loo, et al. by Project Censored, Greg Palast, et al. by Project Censored, Robert McChesney, et al. by Project Censored, Noam Chomsky, et al. by Mumia Abu-Jamal, Project Censored, et al. by Project Censored, Carl Jensen, et al.